Geoffrey Mayne is in need of some serious r’n’r after studying intensively for his bar exams in London. A luxurious Pacific island cruise seems just the ticket, especially when one of his fellow passengers is the attractive young Freda Shannon. But after a terrible storm and shipwreck, Geoffrey and Freda find themselves in a small party of survivors, marooned on a remote South Sea island. The castaways resolve to make the best of what may be a long wait on the deserted isle. But is it really deserted? A gunshot is heard … and then one of their party is found, slain. Is a shadowy denizen intent on murdering the interlopers, or is the hidden truth more diabolical still? 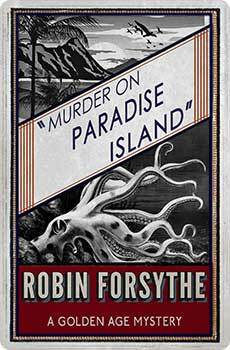 Murder on Paradise Island was first published in 1937. This new edition includes an introduction by crime fiction historian Curtis Evans.